The Heavy Tank T29 is a gift Rank IV American heavy tank with a battle rating 6.7. The T29 was introduced in the Update 1.59 "Flaming Arrows" as a gift vehicle and was available on the Gaijin store for pre-order before the update. The T29 is a formidable heavy tank that introduces the 105 mm T5 cannon in a rotating turret rather than in the fixed case-mate setting on the T95, with a tougher-than-average gun mantlet, and a sloped, but slightly thin hull. The T29 is perhaps one of the most formidable heavy tanks at Rank IV, right up there with the IS-2 and Tiger IIs. With the 105 mm cannon, the T29 can engage most enemies it faces on the battlefield from the front, often destroying an enemy tank with a single shot with the extremely powerful T13 APCBC rounds, and with armor thick enough to block most incoming rounds. 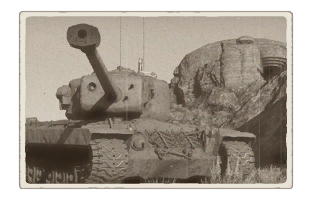 The T29 can act as the "damage sponge" of the team by directing most of the enemy fire towards it. It can also act as a sniping tank by setting it in the back or sides and fire at any unsuspecting enemy tank. A simple APCBC round can destroy even the strongest tank if it penetrates the side armor. Another useful advantage is that the tank is well rounded, but is directed to being a heavy tank in arcade, making it especially powerful. It has average mobility for the heavy tank class, but has a lower top speed than it's main rivals, the IS-2 mod. 1944 and the Tiger IIs, better than only than the Caernarvon. However, it possesses above average acceleration, making it more suited for dense environments. It's gun also possesses a high muzzle velocity, making sniping a viable option. Front belly armour is 25.4 mm thick while the rear is 13 mm. Offensive: When playing offensively with the T29, there are two ways to do it. The more common and safer strategy in an offensive role is for the T29 to team up with another tank, preferably a heavy or medium tank. Move up to the enemy while covering each other, leap frog each time so one tank snipes at enemy while the other moves to a cover position with an advantageous firing position, then keep advancing at a safe pace. The other is to get right up in their face, only giving them shots at the T29's tough frontal armor. As aggressive this strategy is, it leaves the T29 open to attacks from the side and rear. This is a last ditch strategy generally. In either offense strategy, the biggest risk is getting too far ahead from the rest of the friendly team, leaving the T29 vulnerable and without any supporting fire. Defensive: Hull down, the T29 truly shines. Frontally, its turret is tough and the cheeks are sloped enough to bounce most shots. The only real target available would be the small cupola on the turret roof and the turret ring if it is not covered. While the gun barrel is vulnerable to being broken, a moderate crew can repair it in seconds. Although the gun depression isn't as great as other American tanks, it still provides an advantage in hilly terrain. When in the right spot, the player can devastate the enemy team with almost no risk to themselves by exposing only the gun barrel and the top of the mantlet. Do note that there are certain spots and ports in the mantlet that can be penetrated even by a Wirbelwind using Pz GR 40. Players experienced with American heavies can find a good spot that will provide them ample cover while they support the team. Wiggling the turret while reloading can make the enemy bounce, same tactics as seen with the IS-2. Be wary that some shots to the lower gun mantlet has the potential of bouncing the shot down into the thin hull roof. 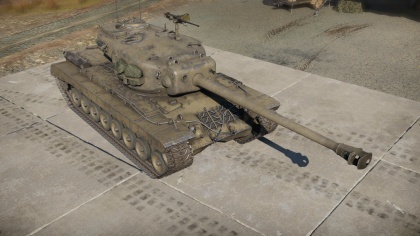 Tiger II (P) and (H): These are going to be the most common and equal enemy in the T29. While most of the T29's front armor can take on the 88 mm APCBC round, APCR can penetrate the front mantlet of the turret. It can also aim for the lower glacis on the hull, which will knock-out the driver and can repeatedly do this until the entire crew gets knocked out. To fight the Tiger II's, aim at the "cheeks" of the turret with any ammo, preferably the right as that is where the gunner sits. Using the T32 APBC ammo, there is a chance that it can penetrate the Tiger II's front glacis at close range (less than 100 meters) and the lower glacis from even further, making the T32 round probably the most preferable round to use against the Tiger II's front. If the T29 can get the Tiger's side though, a simple T13 APCBC round can turn a Tiger II into a fiery ball of fire. Tiger II 10.5 cm: Though the same rule applies to the 88 mm Tiger II, take extreme caution as the 10.5 cm cannon can devastate the T29's interior if it penetrates, and it can from the front. Jagdpanther: Equipped with the same 88 as on the Tiger II, this TD can do some damage if it can get a good shot off the T29. However, the T29's 105 mm cannon can easily penetrate through its front glacis, just don't shoot too close to the gun or the gun mantlet may bounce it. Ferdinand: The greater armor on this tank destroyer makes it harder to fight in a long-range engagement. However, if the T29 can get closer, the flat armor space on the top superstructure and the hull front can prove more vulnerable. Of course, getting to the side of this tank destroyer is a guaranteed point if an APCBC round can be landed into it. SU/ISU-152: While easily destroyed by one shot of the 105 mm cannon, the 152 mm howitzer still can do unspeakable damage if it hits the T29's vulnerable turret and hull roof. Powerful 105 mm gun, similar to the T95. Fast reload time compared to Soviet 122 mm & German 105 mm (12.5 seconds by Ace crew). Fast turret traverse speed (up to 18°/second) with good vertical gun guidance speed. Has U.S. standard gun depression: -10°. T32 APBC can penetrate heavily armored target (such as the Panther II upper glacis in which the T13 APCBC-HE cannot penetrate). T13 APCBC has big amount of HE filler (177 gr TNT-equivalent), every successful penetration is devastating. T29E3 APCR can penetrate Jagdtiger's superstructure quite easily from dead ahead. Heavily armored turret with 203 mm thick mantlet combined with 20 mm spall shield. Good overall frontal hull armor with spare tracks to protect it from first strike. Center lower glacis can bounce shots if angled correctly (59° constructional armor slope + hull angling). Wide tracks can absorb enemy shells if lucky. Maneuverable for its weight (64 tons). Reaches top speed easily (35 km/h top speed). Good acceleration 19.8 MPH (32 km/h) and reverse speed -7.4 MPH (-12 km/h). 3x .50 cal machine guns are perfect for lightly armored vehicles & disrupting enemy's gun scope. 3x .50 cal machine guns can destroy tank tracks with sustained firing. Relatively big size, easy to identify on contact (although comparable to King Tiger by overall size). The gun is frequently damaged by enemy fire due to wide muzzle brake. T32 APBC lacks damage due to poor solid AP performance mechanics. T13 APCBC-HE has below than average penetration (with muzzle velocity of 899 m/s). T29E3 APCR lacks damage due to poor solid AP performance mechanics. The gun optic is a weakspot. Although the additional spall shield can protect it short from autocannon HVAP shot. Thin turret roof armor (38 mm) that can be shot by tanks with high angle gun position. Has U.S. standard side armor thickness (76 mm), using the hull armor to deflect shots is not recommended. Lightly armored lower glacis, Tiger I can penetrate it by shooting at the side end of its glacis. Storing additional ammo will store the projectile in the turret, will explode violently if penetrated. Contrary to popular beliefs, the 2x coaxial .50 cal machine guns are not supported as anti-aircraft weapon. Projects for a dedicated heavy tank for the U.S. Armed Forces began in March 1944 as a response to the German heavy tanks that have been popping up in Europe. While the T26E3 tank, later known as the M26 Pershing was slated to be the next-generation American tank, it was still considered unsuitable against the even heavier Tiger II. A project to increase the armour and firepower commenced to counter this problem, the project titled Heavy Tank T29. Using design elements from the T26E3 with thicker armour and lengthened hull, the T29 also was equipped with the 105 mm Gun T5, a gun in development alongside the heavy assault tank T95. Other features included a 770 hp Ford GAC engine, armour thickness up to 279 mm effective, and a coincidence range-finder. The heavy armour and armament made the tank weigh about 64 tons, making it a close match to the Tiger II. Though the T29 was monstrous itself, side projects involving the T29 crafted the T30 Heavy Tank. Itself similar to the T29 in terms of armour, but featured a monstrous 155 mm Gun T7 with a more powerful engine and an extra crew member to facilitate loading the gun. Throughout World War II, the T29 and the T30 stayed in development under priority "limited procurement". Eventually, the war in Europe ended in May 1945, but the small ordered stayed in hope it may be useful in the Japan invasion in Operation Downfall. That hope was smashed as well when Japan surrendered in September 1945, ending World War II. Even if an operation commenced that used these vehicle, the Army Ground Forces objected to the use of such heavy equipment due to the lack of adequate transporters. Further production was cancelled in the post-war demilitarization. The heavy tank concept didn't end with the war and a final attempt was made to remake the T29 into a more modern, lethal weapon system. This produced the T34 Heavy Tank, which mounted a 120 mm gun based on the M1 anti-aircraft gun. The caliber made an adequate balance of firepower and loading ease between the 105 mm and the 155 mm used in the T29 and T30. In fact, the two T34 pilot models made were a converted T29 and T30. However, the demilitarization took down the T34 program as well, but the experience in this project help engineers in the development of the M103 Heavy Tank. Today, there are a few T29s still in display across the United States, most of them residing in storage at Fort Benning, Georgia where they will be used as display in the future National Armor and Cavalry Museum. This page was last edited on 26 March 2019, at 06:28.